Earlier this week, I saw talented Jessica Chastain in her Oscar-nominated role in critically acclaimed Zero Dark Thirty. 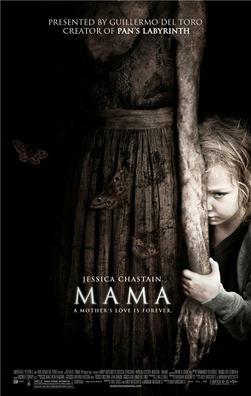 Tonight, I saw her in the Guillermo Del Toro (of Pan’s Labyrinth and Hellboy fame) produced supernatural thriller Mama. I think you can probably guess which is the better film. That is not to say Mama is a bad movie. Quite the contrary. But it does suffer a bit arriving so freshly on the heels of Zero Dark Thirty‘s wide release last weekend. Ah well. Chastain acquits herself nicely in this spooky curio so it shouldn’t hurt her award-winning streak. (Unlike Eddie Murphy’s disastrous January release Norbit a few years ago that all but decimated his chances of winning an Oscar that season for Dreamgirls…if ever). Like The Others, The Sixth Sense, Let Me In, or even the aforementioned Pan‘s Labyrinth, Mama is more dark fairy tale – sort of postmodern Brothers Grimm – than horror. Which was just fine by me. There is an ethereal quality to this story of two little girls left to fend for themselves in the wood after their investment banker father offs himself to avoid the consequences of shady dealings during the economic collapse of 2008. Five years later, their hippie boho uncle and his girlfriend (that would be Chastain) are alerted that the girls have been found and will be coming to live with the couple. Hijinks ensue. So how did two feral little girls survive all that time alone? (By the way, both young actresses are quite remarkable and avoid all the goony, cloying child actor cliches.) Well, let’s just say the title character is a warm-hearted if rather vengeful apparition seeking redemption for an infant she lost decades ago by doing all she can to protect her two young charges from the big, bad world. And that includes terrorizing Chastain with various bumps and jolts and noisy shenanigans. The whole proceedings are Twilight Zone/Outer Limits by way of the CW’s Supernatural. Nothing particularly remarkable or scary or even thought-provoking occurs, but the film has a purposeful, mature approach, establishing a genuinely creepy and compelling atmosphere. The movie’s finest special effect though is Chastain. Like those A-list actors who would riff for Rod Serling for 30 minutes weekly in the 1960s, Chastain sells the silly subject matter, elevating what could have been awkward PG-13 goth drama to an interesting (if ultimately forgettable) allegory on familial heartbreak. Animal Crackers (Pentimenti) is a short film by the talented director Tyler A. Chase and is currently running the festival circuit. It is beautifully done and so compelling. Lead Krista Blomberg is a dynamo. Blomberg, as a potentially murderous parent with seemingly noble intentions, does a marvelous job keeping the viewer off-kilter yet engaged, as we hope to better understand her motivations. She is so committed that she inspires both sympathy and revulsion. Clever edits abound, and great use of symbolism throughout (e.g. bicycles as a metaphor for escape; bird perched on barbed wire, etc.). Chase is a talent worth following. with a tour de force performance by Krista Blomberg . Tom Cruise’s latest Jack Reacher is the cinematic equivalent of fast food, albeit slightly nicer fast food…like Subway. It is pleasant, even rather enjoyable and with a touch of nutritional value…but imminently forgettable. Apparently, this movie is an adaptation of a book series, with which I admit I have zero familiarity. It is clunkily episodic, like one of those goony Janet Evanovich novels…though blessedly without the audience having to suffer through Katherine Heigl this time. (See: One for the Money…no, wait, please DON’T see One for the Money…it was godawful). It also has a fun Sherlock Holmesian procedural-featuring-a-quirkily-flawed-antihero vibe. Tom Cruise is actually a delight as the titular character. I have to admit since his Oprah couch-jumping episode I have enjoyed his subsequent movie output’s steady parade of unhinged, tightly wound, micro men. He has a niche, and he does it well. The rest of the film doesn’t fare as well. It is entertaining throughout…but just don’t think about any of it too hard. 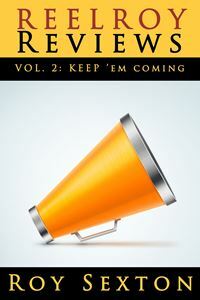 The movie’s tone is ALL over the map, veering wildly from gritty thriller to methodical potboiler to camp action-fest. Robert Duvall pops up unnecessarily in the final act in his typical grizzled, cranky old wise man with a heart of gold role. Richard Jenkins is wasted as a dubiously motivated D.A., and Rosamund Pike is just surprisingly bad, in fact stultifyingly stiff, as Reacher’s defense attorney sidekick. The plot is fairly conventional as Reacher runs and jumps and leaps and squints to find the real killer in a too-close-to-current-headlines sniper shooting. The motivation when finally revealed is like something from an episode of 70s-era Dallas, and Werner Herzog’s villain even worse, like J.R. Ewing if he was raised in Das Boot. The film lurches toward some interesting commentary about how our military/industrial complex can churn out and abandon broken souls for whom violence and gunfire are the only language they know. But just as quickly as the film touches on an intriguing socioeconomic critique about America’s preoccupation with firearms, it flies into a well-paced, lovingly-edited chase scene, and the insightful moment is gone. There was potential here for a fun yet intelligent popcorn flick, a la Skyfall. In fact, Tom Cruise seems like he was primed and ready to be in such a movie. It’s a shame that director Christopher McQuarrie, so good with The Usual Suspects and Valkyrie, showed up ready to direct a very special episode of CH*Ps.